In this guide we will discuss adding contacts to your Local Directory on your Yealink T19p Office phone. A local directory will allow you to store up to 1000 contacts locally on your phone in up to 6 user defined groups. Once configured when your phone rings the contacts information will be displayed on the T19p's LCD display and you can access and search this phone book / directory to place calls. 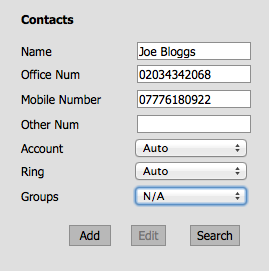 Adding contacts can then be performed in from the phones admin panel or by using your desk phones UI. If you haven't logged into your phones admin panel before please click here for a full guide. or by uploading a CSV file. We have included a formatted CSV template below that you can download and populate with your contact information. Click choose file -> Navigate to your saved contact.csv file -> select this file and click 'Import CSV'. Once uploaded you will be able to see your contacts in the list on the contact tab page. If you need to add a number quickly to your local directory you can add a contact directly from your phones user interface (UI). You can then 'Add' a phone number by filling in their name and scrolling down on the directional keys their number. 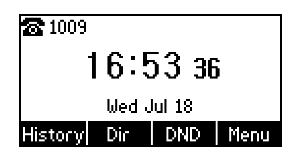 Once completed press save to add the contact to your local directory. A particularly good place to add contacts is in the recent caller 'History' section of the phone. Add a name for the contact and press save to add a user to the local directory.